This article is about the Soviet/Russian space station. For other uses, see Mir (disambiguation). Mir (Russian: Мир, IPA: [ˈmʲir]; lit. peace or world) was a space station that operated in low Earth orbit from 1986 to 2001, operated by the Soviet Union and later by Russia. Mir was the first modular space station and was assembled in orbit from 1986 to 1996. It had a greater mass than any previous spacecraft. At the time it was the largest artificial satellite in orbit, succeeded by the International Space Station (ISS) after Mir's orbit decayed. The station served as a microgravity research laboratory in which crews conducted experiments in biology, human biology, physics, astronomy, meteorology, and spacecraft systems with a goal of developing technologies required for permanent occupation of space. Mir was authorised by a 17 February 1976 decree, to design an improved model of the Salyut DOS-17K space stations. Four Salyut space stations had been launched since 1971, with three more being launched during Mir's development. It was planned that the station's core module (DOS-7 and the backup DOS-8) would be equipped with a total of four docking ports; two at either end of the station as with the Salyut stations, and an additional two ports on either side of a docking sphere at the front of the station to enable further modules to expand the station's capabilities. By August 1978, this had evolved to the final configuration of one aft port and five ports in a spherical compartment at the forward end of the station. It was originally planned that the ports would connect to 7.5-tonne (8.3-short-ton) modules derived from the Soyuz spacecraft. These modules would have used a Soyuz propulsion module, as in Soyuz and Progress, and the descent and orbital modules would have been replaced with a long laboratory module. Following a February 1979 governmental resolution, the programme was consolidated with Vladimir Chelomei's manned Almaz military space station programme. The docking ports were reinforced to accommodate 20-tonne (22-short-ton) space station modules based on the TKS spacecraft. NPO Energia was responsible for the overall space station, with work subcontracted to KB Salyut, due to ongoing work on the Energia rocket and Salyut 7, Soyuz-T, and Progress spacecraft. KB Salyut began work in 1979, and drawings were released in 1982 and 1983. New systems incorporated into the station included the Salyut 5B digital flight control computer and gyrodyne flywheels (taken from Almaz), Kurs automatic rendezvous system, Luch satellite communications system, Elektron oxygen generators, and Vozdukh carbon dioxide scrubbers. By early 1984, work on Mir had halted while all resources were being put into the Buran programme in order to prepare the Buran spacecraft for flight testing. Funding resumed in early 1984 when Valentin Glushko was ordered by the Central Committee's Secretary for Space and Defence to orbit Mir by early 1986, in time for the 27th Communist Party Congress. It was clear that the planned processing flow could not be followed and still meet the 1986 launch date. It was decided on Cosmonaut's Day (12 April) 1985 to ship the flight model of the base block to the Baikonur cosmodrome and conduct the systems testing and integration there. The module arrived at the launch site on 6 May, with 1100 of 2500 cables requiring rework based on the results of tests to the ground test model at Khrunichev. In October, the base block was rolled outside its cleanroom to carry out communications tests. The first launch attempt on 16 February 1986 was scrubbed when the spacecraft communications failed, but the second launch attempt, on 19 February 1986 at 21:28:23 UTC, was successful, meeting the political deadline. The orbital assembly of Mir began on 19 February 1986 with the launch of the Proton-K rocket. Four of the six modules which were later added (Kvant-2 in 1989, Kristall in 1990, Spektr in 1995 and Priroda in 1996) followed the same sequence to be added to the main Mir complex. Firstly, the module would be launched independently on its own Proton-K and chase the station automatically. It would then dock to the forward docking port on the core module's docking node, then extend its Lyappa arm to mate with a fixture on the node's exterior. The arm would then lift the module away from the forward docking port and rotate it on to the radial port where it was to mate, before lowering it to dock. The node was equipped with only two Konus drogues, which were required for dockings. This meant that, prior to the arrival of each new module, the node would have to be depressurised to allow spacewalking cosmonauts to manually relocate the drogue to the next port to be occupied. The other two expansion modules, Kvant-1 in 1987 and the docking module in 1995, followed different procedures. Kvant-1, having, unlike the four modules mentioned above, no engines of its own, was launched attached to a tug based on the TKS spacecraft which delivered the module to the aft end of the core module instead of the docking node. Once hard docking had been achieved, the tug undocked and deorbited itself. The docking module, meanwhile, was launched aboard Space Shuttle Atlantis during STS-74 and mated to the orbiter's Orbiter Docking System. Atlantis then docked, via the module, to Kristall, then left the module behind when it undocked later in the mission. Various other external components, including three truss structures, several experiments and other unpressurised elements were also mounted to the exterior of the station by cosmonauts conducting a total of eighty spacewalks over the course of the station's history. The station's assembly marked the beginning of the third generation of space station design, being the first to consist of more than one primary spacecraft (thus opening a new era in space architecture). First generation stations such as Salyut 1 and Skylab had monolithic designs, consisting of one module with no resupply capability; the second generation stations Salyut 6 and Salyut 7 comprised a monolithic station with two ports to allow consumables to be replenished by cargo spacecraft such as Progress. The capability of Mir to be expanded with add-on modules meant that each could be designed with a specific purpose in mind (for instance, the core module functioned largely as living quarters), thus eliminating the need to install all the station's equipment in one module. The base block for the entire Mir complex, the core module, or DOS-7, provided the main living quarters for resident crews and contained environmental systems, early attitude control systems and the station's main engines. The module was based on hardware developed as part of the Salyut programme, and consisted of a stepped-cylinder main compartment and a spherical 'node' module, which served as an airlock and provided ports to which four of the station's expansion modules were berthed and to which a Soyuz or Progress spacecraft could dock. The module's aft port served as the berthing location for Kvant-1. The first TKS based module, Kvant-2, was divided into three compartments: an EVA airlock, an instrument/cargo compartment (which could function as a backup airlock), and an instrument/experiment compartment. The module also carried a Soviet version of the Manned Maneuvering Unit for the Orlan space suit, referred to as Ikar, a system for regenerating water from urine, a shower, the Rodnik water storage system and six gyrodynes to augment those already located in Kvant-1. Scientific equipment included a high-resolution camera, spectrometers, X-ray sensors, the Volna 2 fluid flow experiment, and the Inkubator-2 unit, which was used for hatching and raising quail. Spektr was the first of the three modules launched during the Shuttle-Mir programme; it served as the living quarters for American astronauts and housed NASA-sponsored experiments. The module was designed for remote observation of Earth's environment and contained atmospheric and surface research equipment. It featured four solar arrays which generated approximately half of the station's electrical power. The module also had a science airlock to expose experiments to the vacuum of space selectively. Spektr was rendered unusable following the collision with Progress M-34 in 1997 which damaged the module, exposing it to the vacuum of space. The docking module was designed to help simplify Space Shuttle dockings to Mir. Before the first shuttle docking mission (STS-71), the Kristall module had to be tediously moved to ensure sufficient clearance between Atlantis and Mir's solar arrays. With the addition of the docking module, enough clearance was provided without the need to relocate Kristall. It had two identical APAS-89 docking ports, one attached to the distal port of Kristall with the other available for shuttle docking. The seventh and final Mir module, Priroda's primary purpose was to conduct Earth resource experiments through remote sensing and to develop and verify remote sensing methods. The module's experiments were provided by twelve different nations, and covered microwave, visible, near infrared, and infrared spectral regions using both passive and active sounding methods. The module possessed both pressurised and unpressurised segments, and featured a large, externally mounted synthetic aperture radar dish. In addition to the pressurised modules, Mir featured several external components. The largest component was the Sofora girder, a large scaffolding-like structure consisting of 20 segments which, when assembled, projected 14 metres from its mount on Kvant-1. A self-contained thruster block, the VDU, was mounted on the end of Sofora and was used to augment the roll-control thrusters on the core module. The VDU's increased distance from Mir's axis allowed an 85% decrease in fuel consumption, reducing the amount of propellant required to orient the station. A second girder, Rapana, was mounted aft of Sofora on Kvant-1. This girder, a small prototype of a structure intended to be used on Mir-2 to hold large parabolic dishes away from the main station structure, was 5 metres long and used as a mounting point for externally mounted exposure experiments. To assist in moving objects around the exterior of the station during EVAs, Mir featured two Strela cargo cranes mounted to the sides of the core module, used for moving spacewalking cosmonauts and parts. The cranes consisted of telescopic poles assembled in sections which measured around 1.8 metres (6 ft) when collapsed, but when extended using a hand crank were 14 metres (46 ft) long, meaning that all of the station's modules could be accessed during spacewalks. Each module was fitted with external components specific to the experiments that were carried out within that module, the most obvious being the Travers antenna mounted to Priroda. This synthetic aperture radar consisted of a large dish-like framework mounted outside the module, with associated equipment within, used for Earth observations experiments, as was most of the other equipment on Priroda, including various radiometers and scan platforms. Kvant-2 also featured several scan platforms and was fitted with a mounting bracket to which the cosmonaut manoeuvring unit, or Ikar, was mated. This backpack was designed to assist cosmonauts in moving around the station and the planned Buran in a manner similar to the US Manned Maneuvering Unit, but it was only used once, during EO-5. In addition to module-specific equipment, Kvant-2, Kristall, Spektr and Priroda were each equipped with one Lyappa arm, a robotic arm which, after the module had docked to the core module's forward port, grappled one of two fixtures positioned on the core module's docking node. The arriving module's docking probe was then retracted, and the arm raised the module so that it could be pivoted 90° for docking to one of the four radial docking ports. Photovoltaic (PV) arrays powered Mir. The station used a 28 volt DC supply which provided 5-, 10-, 20- and 50-amp taps. When the station was illuminated by sunlight, several solar arrays mounted on the pressurised modules provided power to Mir's systems and charged the nickel-cadmium storage batteries installed throughout the station. The arrays rotated in only one degree of freedom over a 180° arc, and tracked the sun using sun sensors and motors installed in the array mounts. The station itself also had to be oriented to ensure optimum illumination of the arrays. When the station's all-sky sensor detected that Mir had entered Earth's shadow, the arrays were rotated to the optimum angle predicted for reacquiring the sun once the station passed out of the shadow. The batteries, each of 60 Ah capacity, were then used to power the station until the arrays recovered their maximum output on the day side of Earth. The solar arrays themselves were launched and installed over a period of eleven years, more slowly than originally planned, with the station continually suffering from a shortage of power as a result. The first two arrays, each 38 m2 (409 ft2) in area, were launched on the core module, and together provided a total of 9 kW of power. A third, dorsal panel was launched on Kvant-1 and mounted on the core module in 1987, providing a further 2 kW from a 22 m2 (237 ft2) area. Kvant-2, launched in 1989, provided two 10 m (32.8 ft) long panels which supplied 3.5 kW each, whilst Kristall was launched with two collapsible, 15 m (49.2 ft) long arrays (providing 4 kW each) which were intended to be moved to Kvant-1 and installed on mounts which were attached during a spacewalk by the EO-8 crew in 1991. This relocation was begun in 1995, when the panels were retracted and the left panel installed on Kvant-1. By this time all the arrays had degraded and were supplying much less power. To rectify this, Spektr (launched in 1995), which had initially been designed to carry two arrays, was modified to hold four, providing a total of 126 m2 (1360 ft2) of array with a 16 kW supply. Two further arrays were flown to the station on board the Space Shuttle Atlantis during STS-74, carried on the docking module. The first of these, the Mir cooperative solar array, consisted of American photovoltaic cells mounted on a Russian frame. It was installed on the unoccupied mount on Kvant-1 in May 1996 and was connected to the socket that had previously been occupied by the core module's dorsal panel, which was by this point barely supplying 1 kW. The other panel, originally intended to be launched on Priroda, replaced the Kristall panel on Kvant-1 in November 1997, completing the station's electrical system. Mir was maintained in a near circular orbit with an average perigee of 354 km (220 mi) and an average apogee of 374 km (232 mi), travelling at an average speed of 27,700 km/h (17,200 mph) and completing 15.7 orbits per day. As the station constantly lost altitude because of slight atmospheric drag, it needed to be boosted to a higher altitude several times each year. This boost was generally performed by Progress resupply vessels, although during the Shuttle-Mir programme the task was performed by US Space Shuttles, and, prior to the arrival of Kvant-1, the engines on the core module could also accomplish the task. Attitude control was maintained by a combination of two mechanisms; in order to hold a set attitude, a system of twelve control moment gyroscopes (CMGs, or "gyrodynes") rotating at 10,000 rpm kept the station oriented, six CMGs being located in each of the Kvant-1 and Kvant-2 modules. When the attitude of the station needed to be changed, the gyrodynes were disengaged, thrusters (including those mounted directly to the modules, and the VDU thruster used for roll control mounted to the Sofora girder) were used to attain the new attitude and the CMGs were reengaged. This was done fairly regularly depending on experimental needs; for instance, Earth or astronomical observations required that the instrument recording images be continuously aimed at the target, and so the station was oriented to make this possible. Conversely, materials processing experiments required the minimisation of movement on board the station, and so Mir would be oriented in a gravity gradient attitude for stability. Prior to the arrival of the modules containing these gyrodynes, the station's attitude was controlled using thrusters located on the core module alone, and, in an emergency, the thrusters on docked Soyuz spacecraft could be used to maintain the station's orientation. Radio communications provided telemetry and scientific data links between Mir and the RKA Mission Control Centre (TsUP). Radio links were also used during rendezvous and docking procedures and for audio and video communication between crew members, flight controllers and family members. As a result, Mir was equipped with several communication systems used for different purposes. The station communicated directly with the ground via the Lira antenna mounted to the core module. The Lira antenna also had the capability to use the Luch data relay satellite system (which fell into disrepair in the 1990s) and the network of Soviet tracking ships deployed in various locations around the world (which also became unavailable in the 1990s). UHF radio was used by cosmonauts conducting EVAs. UHF was also employed by other spacecraft that docked to or undocked from the station, such as Soyuz, Progress, and the Space Shuttle, in order to receive commands from the TsUP and Mir crew members via the TORU system. The differences in orbital plane between different locations on the station. Mir's environmental control and life support system (ECLSS) provided or controlled atmospheric pressure, fire detection, oxygen levels, waste management and water supply. The highest priority for the ECLSS was the station's atmosphere, but the system also collected, processed, and stored waste and water produced and used by the crew—a process that recycles fluid from the sink, toilet, and condensation from the air. The Elektron system generated oxygen. Bottled oxygen and solid fuel oxygen generation (SFOG) canisters, a system known as Vika, provided backup. Carbon dioxide was removed from the air by the Vozdukh system. Other byproducts of human metabolism, such as methane from the intestines and ammonia from sweat, were removed by activated charcoal filters. Similar systems are presently used on the ISS. The atmosphere on Mir was similar to Earth's. Normal air pressure on the station was 101.3 kPa (14.7 psi); the same as at sea level on Earth. An Earth-like atmosphere offers benefits for crew comfort, and is much safer than the alternative, a pure oxygen atmosphere, because of increased fire risk such as occurred with Apollo 1. Intercosmos ("ИнтерКосмос" Interkosmos) was a Soviet Union space exploration programme which allowed members from the military forces of allied Warsaw Pact countries to participate in manned and unmanned space exploration missions. Participation was also made available to governments of countries, such as France and India. Canada visited Mir in November 1995 as a Mission Specialist 1 STS-74. Hadfield played guitar aboard the station. In the early 1980s, NASA planned to launch a modular space station called Freedom as a counterpart to Mir, while the Soviets were planning to construct Mir-2 in the 1990s as a replacement for the station. Because of budget and design constraints, Freedom never progressed past mock-ups and minor component tests and, with the fall of the Soviet Union and the end of the Space Race, the project was nearly cancelled entirely by the United States House of Representatives. The post-Soviet economic chaos in Russia also led to the cancellation of Mir-2, though only after its base block, DOS-8, had been constructed. Similar budgetary difficulties were faced by other nations with space station projects, which prompted the US government to negotiate with European states, Russia, Japan, and Canada in the early 1990s to begin a collaborative project. In June 1992, American president George H. W. Bush and Russian president Boris Yeltsin agreed to cooperate on space exploration. The resulting Agreement between the United States of America and the Russian Federation Concerning Cooperation in the Exploration and Use of Outer Space for Peaceful Purposes called for a short joint space programme with one American astronaut deployed to the Russian space station Mir and two Russian cosmonauts deployed to a Space Shuttle. In September 1993, US Vice President Al Gore, Jr., and Russian Prime Minister Viktor Chernomyrdin announced plans for a new space station, which eventually became the ISS. They also agreed, in preparation of this new project, that the United States would be heavily involved in the Mir programme as part of an international project known as the Shuttle–Mir Programme. The project, sometimes called "Phase One", was intended to allow the United States to learn from Russian experience in long-duration spaceflight and to foster a spirit of cooperation between the two nations and their space agencies, the US National Aeronautics and Space Administration (NASA) and the Russian Federal Space Agency (Roskosmos). The project prepared the way for further cooperative space ventures, specifically, "Phase Two" of the joint project, the construction of the ISS. The programme was announced in 1993; the first mission started in 1994, and the project continued until its scheduled completion in 1998. Eleven Space Shuttle missions, a joint Soyuz flight, and almost 1000 cumulative days in space for US astronauts occurred over the course of seven long-duration expeditions. A view of the interior of the core module's docking node, showing the crowded nature of the station. Inside, the 130-tonne (140-short-ton) Mir resembled a cramped labyrinth, crowded with hoses, cables and scientific instruments—as well as articles of everyday life, such as photos, children's drawings, books and a guitar. It commonly housed three crew members, but was capable of supporting as many as six for up to a month. The station was designed to remain in orbit for around five years; it remained in orbit for fifteen. As a result, NASA astronaut John Blaha reported that, with the exception of Priroda and Spektr, which were added late in the station's life, Mir did look used, which is to be expected given it had been lived in for ten to eleven years without being brought home and cleaned. The time zone used on board Mir was Moscow Time (UTC+03). The windows were covered during night hours to give the impression of darkness because the station experienced 16 sunrises and sunsets a day. A typical day for the crew began with a wake-up at 08:00, followed by two hours of personal hygiene and breakfast. Work was conducted from 10:00 until 13:00, followed by an hour of exercise and an hour's lunch break. Three more hours of work and another hour of exercise followed lunch, and the crews began preparing for their evening meal at about 19:00. The cosmonauts were free to do as they wished in the evening, and largely worked to their own pace during the day. In their spare time, crews were able to catch up with work, observe the Earth below, respond to letters, drawings and other items brought from Earth (and give them an official stamp to show they had been aboard Mir), or make use of the station's ham radio. Two amateur radio call signs, U1MIR and U2MIR, were assigned to Mir in the late 1980s, allowing amateur radio operators on Earth to communicate with the cosmonauts. The station was also equipped with a supply of books and films for the crew to read and watch. NASA astronaut Jerry Linenger related how life on board Mir was structured and lived according to the detailed itineraries provided by ground control. Every second on board was accounted for and all activities were timetabled. After working some time on Mir, Linenger came to feel that the order in which his activities were allocated did not represent the most logical or efficient order possible for these activities. He decided to perform his tasks in an order that he felt enabled him to work more efficiently, be less fatigued, and suffer less from stress. Linenger noted that his comrades on Mir did not "improvise" in this way, and as a medical doctor he observed the effects of stress on his comrades that he believed was the outcome of following an itinerary without making modifications to it. Despite this, he commented that his comrades performed all their tasks in a supremely professional manner. Astronaut Shannon Lucid, who set the record for longest stay in space by a woman while aboard Mir (surpassed by Sunita Williams 11 years later on the ISS), also commented about working aboard Mir saying "I think going to work on a daily basis on Mir is very similar to going to work on a daily basis on an outstation in Antarctica. The big difference with going to work here is the isolation, because you really are isolated. You don't have a lot of support from the ground. You really are on your own." To prevent some of these effects, the station was equipped with two treadmills (in the core module and Kvant-2) and a stationary bicycle (in the core module); each cosmonaut was to cycle the equivalent of 10 kilometres (6.2 mi) and run the equivalent of 5 kilometres (3.1 mi) per day. Cosmonauts used bungee cords to strap themselves to the treadmill. Researchers believe that exercise is a good countermeasure for the bone and muscle density loss that occurs in low-gravity situations. There were two space toilets (ASUs) on Mir, located in the core module and Kvant-2. They used a fan-driven suction system similar to the Space Shuttle Waste Collection System. The user is first fastened to the toilet seat, which was equipped with spring-loaded restraining bars to ensure a good seal. A lever operated a powerful fan and a suction hole slid open: the air stream carried the waste away. Solid waste was collected in individual bags which were stored in an aluminium container. Full containers were transferred to Progress spacecraft for disposal. Liquid waste was evacuated by a hose connected to the front of the toilet, with anatomically appropriate "urine funnel adapters" attached to the tube so both men and women could use the same toilet. Waste was collected and transferred to the Water Recovery System, where it was recycled back into drinking water, although this was usually used to produce oxygen via the Elektron system. Mir featured a shower, the Bania, located in Kvant-2. It was an improvement on the units installed in previous Salyut stations, but proved difficult to use due to the time required to set up, use, and stow. The shower, which featured a plastic curtain and fan to collect water via an airflow, was later converted into a steam room; it eventually had its plumbing removed and the space was reused. When the shower was unavailable, crew members washed using wet wipes, with soap dispensed from a toothpaste tube-like container, or using a washbasin equipped with a plastic hood, located in the core module. Crews were also provided with rinse-less shampoo and edible toothpaste to save water. The station provided two permanent crew quarters, the Kayutkas, phonebox-sized booths set towards the rear of the core module, each featuring a tethered sleeping bag, a fold-out desk, a porthole, and storage for personal effects. Visiting crews had no allocated sleep module, instead attaching a sleeping bag to an available space on a wall; US astronauts installed themselves within Spektr until a collision with a Progress spacecraft caused the depressurisation of that module. It was important that crew accommodations be well ventilated; otherwise, astronauts could wake up oxygen-deprived and gasping for air, because a bubble of their own exhaled carbon dioxide had formed around their heads. Most of the food eaten by station crews was frozen, refrigerated or canned. Menus were prepared by the cosmonauts, with the help of a dietitian, before their flight to the station. The diet was designed to provide around 100 g of protein, 130 g of fat and 330 g of carbohydrates per day, in addition to appropriate mineral and vitamin supplements. Meals were spaced out through the day to aid assimilation. Canned food such as jellied beef tongue was placed into a niche in the core module's table, where it could be warmed in 5–10 minutes. Usually, crews drank tea, coffee and fruit juices, but, unlike the ISS, the station also had a supply of cognac and vodka for special occasions. In the 1990s samples of extremophile moulds were taken from Mir. Ninety species of micro-organisms were found in 1990, four years after the station's launch. By the time of its decommission in 2001, the number of known different micro-organisms had grown to 140. As space stations get older, the problems with contamination get worse. Moulds that develop aboard space stations can produce acids that degrade metal, glass and rubber. The moulds in Mir were found growing behind panels and inside air-conditioning equipment. The moulds also caused a foul smell, which was often cited as visitors' strongest impressions. Researchers in 2018 reported, after detecting the presence on the International Space Station (ISS) of five Enterobacter bugandensis bacterial strains, none pathogenic to humans, that microorganisms on ISS should be carefully monitored to continue assuring a medically healthy environment for the astronauts. Mir was visited by a total of 28 long-duration or "principal" crews, each of which was given a sequential expedition number formatted as EO-X. Expeditions varied in length (from the 72-day flight of the crew of EO-28 to the 437-day flight of Valeri Polyakov), but generally lasted around six months. Principal expedition crews consisted of two or three crew members, who often launched as part of one expedition but returned with another (Polyakov launched with EO-14 and landed with EO-17). The principal expeditions were often supplemented with visiting crews who remained on the station during the week-long handover period between one crew and the next before returning with the departing crew, the station's life support system being able to support a crew of up to six for short periods. The station was occupied for a total of four distinct periods; 12 March–16 July 1986 (EO-1), 5 February 1987 – 27 April 1989 (EO-2–EO-4), the record-breaking run from 5 September 1989 – 28 August 1999 (EO-5–EO-27), and 4 April–16 June 2000 (EO-28). By the end, it had been visited by 104 different people from twelve different nations, making it the most visited spacecraft in history (a record later surpassed by the ISS). Due to the pressure to launch the station on schedule, mission planners were left without Soyuz spacecraft or modules to launch to the station at first. It was decided to launch Soyuz T-15 on a dual mission to both Mir and Salyut 7. 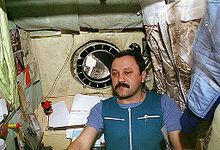 Leonid Kizim and Vladimir Solovyov first docked with Mir on 15 March 1986. During their nearly 51-day stay on Mir, they brought the station online and checked its systems. They unloaded two Progress spacecraft launched after their arrival, Progress 25 and Progress 26. The second expedition to Mir, EO-2, launched on Soyuz TM-2 on 5 February 1987. During their stay, the Kvant-1 module, launched on 30 March 1987, arrived. It was the first experimental version of a planned series of '37K' modules scheduled to be launched to Mir on Buran. Kvant-1 was originally planned to dock with Salyut 7; due to technical problems during its development, it was reassigned to Mir. The module carried the first set of six gyroscopes for attitude control. The module also carried instruments for X-ray and ultraviolet astrophysical observations. The initial rendezvous of the Kvant-1 module with Mir on 5 April 1987 was troubled by the failure of the onboard control system. After the failure of the second attempt to dock, the resident cosmonauts, Yuri Romanenko and Aleksandr Laveykin, conducted an EVA to fix the problem. They found a trash bag which had been left in orbit after the departure of one of the previous cargo ships and was now located between the module and the station, which prevented the docking. After removing the bag, docking was completed on 12 April. The Soyuz TM-2 launch was the beginning of a string of 6 Soyuz launches and three long-duration crews between 5 February 1987 and 27 April 1989. This period also saw the first international visitors, Muhammed Faris (Syria), Abdul Ahad Mohmand (Afghanistan) and Jean-Loup Chrétien (France). With the departure of EO-4 on Soyuz TM-7 on 27 April 1989 the station was again left unoccupied. The launch of Soyuz TM-8 on 5 September 1989 marked the beginning of the longest human presence in space, until 23 October 2010, when this record was surpassed by the ISS. It also marked the beginning of Mir's second expansion. The Kvant-2 and Kristall modules were now ready for launch. Alexander Viktorenko and Aleksandr Serebrov docked with Mir and brought the station out of its five-month hibernation. On 29 September the cosmonauts installed equipment in the docking system in preparation for the arrival of Kvant-2, the first of the 20 tonne add-on modules based on the TKS spacecraft from the Almaz programme. After a 40-day delay caused by faulty computer chips, Kvant-2 was launched on 26 November 1989. After problems deploying the craft's solar array and with the automated docking systems on both Kvant-2 and Mir, the new module was docked manually on 6 December. Kvant-2 added a second set of gyrodines to Mir, and brought the new life support systems for recycling water and generating oxygen, reducing dependence on ground resupply. The module featured a large airlock with a one-metre hatch. A special backpack unit (known as Ikar), an equivalent of the US Manned Maneuvering Unit, was located inside Kvant-2's airlock. Soyuz TM-9 launched EO-6 crew members Anatoly Solovyev and Aleksandr Balandin on 11 February 1990. While docking, the EO-5 crew noted that three thermal blankets on the ferry were loose, potentially creating problems on reentry, but it was decided that they would be manageable. Their stay on board Mir saw the addition of the Kristall module, launched 31 May 1990. The first docking attempt on 6 June was aborted due to an attitude control thruster failure. Kristall arrived at the front port on 10 June and was relocated to the lateral port opposite Kvant-2 the next day, restoring the equilibrium of the complex. Due to the delay in the docking of Kristall, EO-6 was extended by 10 days to permit the activation of the module's systems and to accommodate an EVA to repair the loose thermal blankets on Soyuz TM-9. Kristall contained furnaces for use in producing crystals under microgravity conditions (hence the choice of name for the module). The module was also equipped with biotechnology research equipment, including a small greenhouse for plant cultivation experiments which was equipped with a source of light and a feeding system, in addition to equipment for astronomical observations. The most obvious features of the module were the two Androgynous Peripheral Attach System (APAS-89) docking ports designed to be compatible with the Buran spacecraft. Although they were never used in a Buran docking, they were useful later during the Shuttle-Mir programme, providing a berthing location for US Space Shuttles. The EO-7 relief crew arrived aboard Soyuz TM-10 on 3 August 1990. The new crew arrived at Mir with quail for Kvant-2's cages, one of which laid an egg en route to the station. It was returned to Earth, along with 130 kg of experiment results and industrial products, in Soyuz TM-9. Two more expeditions, EO-8 and EO-9, continued the work of their predecessors whilst tensions grew back on Earth. The EO-10 crew, launched aboard Soyuz TM-13 on 2 October 1991, was the last crew to launch from the USSR and continued the occupation of Mir during the fall of the Soviet Union. The crew launched as Soviet citizens and returned to earth as Russians. The newly formed Russian Federal Space Agency (Roskosmos) was unable to finance the unlaunched Spektr and Priroda modules, instead putting them into storage and ending Mir's second expansion. The first manned mission flown from an independent Kazakhstan was Soyuz TM-14, launched on 17 March 1992, which carried the EO-11 crew to Mir, docking on 19 March before the departure of Soyuz TM-13. On 17 June, Russian President Boris Yeltsin and US President George H. W. Bush announced what would later become the Shuttle-Mir programme, a cooperative venture which proved useful to the cash-strapped Roskosmos (and led to the eventual completion and launch of Spektr and Priroda). EO-12 followed in July, alongside a brief visit by French astronaut Michel Tognini. The following crew, EO-13, began preparations for the Shuttle-Mir programme by flying to the station in a modified spacecraft, Soyuz TM-16 (launched on 26 January 1993), which was equipped with an APAS-89 docking system rather than the usual probe-and-drogue, enabling it to dock to Kristall and test the port which would later be used by US space shuttles. The spacecraft also enabled controllers to obtain data on the dynamics of docking a spacecraft to a space station off the station's longitudinal axis, in addition to data on the structural integrity of this configuration via a test called Rezonans conducted on 28 January. Soyuz TM-15, meanwhile, departed with the EO-12 crew on 1 February. Throughout the period following the collapse of the USSR, crews on Mir experienced occasional reminders of the economic chaos occurring in Russia. The initial cancellation of Spektr and Priroda was the first such sign, followed by the reduction in communications as a result of the fleet of tracking ships being withdrawn from service by Ukraine. The new Ukrainian government also vastly raised the price of the Kurs docking systems, manufactured in Kiev – the Russians' attempts to reduce their dependence on Kurs would later lead to accidents during TORU tests in 1997. Various Progress spacecraft had parts of their cargoes missing, either because the consumable in question had been unavailable, or because the ground crews at Baikonur had looted them. The problems became particularly obvious during the launch of the EO-14 crew aboard Soyuz TM-17 in July; shortly before launch there was a black-out at the pad, and the power supply to the nearby city of Leninsk failed an hour after launch. Nevertheless, the spacecraft launched on time and arrived at the station two days later. All of Mir's ports were occupied, and so Soyuz TM-17 had to station-keep 200 metres away from the station for half an hour before docking while Progress M-18 vacated the core module's front port and departed. The EO-13 crew departed on 22 July, and soon after Mir passed through the annual Perseid meteor shower, during which the station was hit by several particles. A spacewalk was conducted on 28 September to inspect the station's hull, but no serious damage was reported. Soyuz TM-18 arrived on 10 January 1994 carrying the EO-15 crew (including Valeri Polyakov, who was to remain on Mir for 14 months), and Soyuz TM-17 left on 14 January. The undocking was unusual in that the spacecraft was to pass along Kristall in order to obtain photographs of the APAS to assist in the training of space shuttle pilots. Due to an error in setting up the control system, the spacecraft struck the station a glancing blow during the manoeuvre, scratching the exterior of Kristall. On 3 February 1994, Mir veteran Sergei Krikalev became the first Russian cosmonaut to launch on a US spacecraft, flying on Space Shuttle Discovery during STS-60. Space Shuttle Atlantis docked to Mir on STS-71. The 3 February launch of Space Shuttle Discovery, flying STS-63, opened operations on Mir for 1995. Referred to as the "near-Mir" mission, the mission saw the first rendezvous of a space shuttle with Mir as the orbiter approached within 37 feet (11 m) of the station as a dress rehearsal for later docking missions and for equipment testing. Five weeks after Discovery's departure, the EO-18 crew, including the first US cosmonaut Norman Thagard, arrived in Soyuz TM-21. The EO-17 crew left a few days later, with Polyakov completing his record-breaking 437-day spaceflight. During EO-18, the Spektr science module (which served as living and working space for American astronauts) was launched aboard a Proton rocket and docked to the station, carrying research equipment from America and other nations. The expedition's crew returned to Earth aboard Space Shuttle Atlantis following the first Shuttle–Mir docking mission, STS-71. Atlantis, launched on 27 June 1995, successfully docked with Mir on 29 June becoming the first US spacecraft to dock with a Russian spacecraft since the ASTP in 1975. The orbiter delivered the EO-19 crew and returned the EO-18 crew to Earth. The EO-20 crew were launched on 3 September, followed in November by the arrival of the docking module during STS-74. The two-man EO-21 crew was launched on 21 February 1996 aboard Soyuz TM-23 and were soon joined by US crew member Shannon Lucid, who was brought to the station by Atlantis during STS-76. This mission saw the first joint US spacewalk on Mir take place deploying the Mir Environmental Effects Payload package on the docking module. Lucid became the first American to carry out a long-duration mission aboard Mir with her 188-day mission, which set the US single spaceflight record. During Lucid's time aboard Mir, Priroda, the station's final module, arrived as did French visitor Claudie Haigneré flying the Cassiopée mission. The flight aboard Soyuz TM-24 also delivered the EO-22 crew of Valery Korzun and Aleksandr Kaleri. Lucid's stay aboard Mir ended with the flight of Atlantis on STS-79, which launched on 16 September. This, the fourth docking, saw John Blaha transferring onto Mir to take his place as resident US astronaut. His stay on the station improved operations in several areas, including transfer procedures for a docked space shuttle, "hand-over" procedures for long-duration American crew members and "ham" amateur radio communications, and also saw two spacewalks to reconfigure the station's power grid. Blaha spent four months with the EO-22 crew before returning to Earth aboard Atlantis on STS-81 in January 1997, at which point he was replaced by physician Jerry Linenger. During his flight, Linenger became the first American to conduct a spacewalk from a foreign space station and the first to test the Russian-built Orlan-M spacesuit alongside Russian cosmonaut Vasili Tsibliyev, flying EO-23. All three crew members of EO-23 performed a "fly-around" in Soyuz TM-25 spacecraft. Linenger and his Russian crewmates Vasili Tsibliyev and Aleksandr Lazutkin faced several difficulties during the mission, including the most severe fire aboard an orbiting spacecraft (caused by a malfunctioning Vika), failures of various systems, a near collision with Progress M-33 during a long-distance TORU test and a total loss of station electrical power. The power failure also caused a loss of attitude control, which led to an uncontrolled "tumble" through space. Linenger was succeeded by Anglo-American astronaut Michael Foale, carried up by Atlantis on STS-84, alongside Russian mission specialist Elena Kondakova. Foale's increment proceeded fairly normally until 25 June when during the second test of the Progress manual docking system, TORU, Progress M-34 collided with solar arrays on the Spektr module and crashed into the module's outer shell, puncturing the module and causing depressurisation on the station. 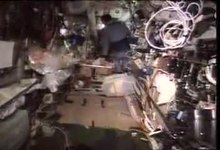 Only quick actions on the part of the crew, cutting cables leading to the module and closing Spektr's hatch, prevented the crews having to abandon the station in Soyuz TM-25. Their efforts stabilised the station's air pressure, whilst the pressure in Spektr, containing many of Foale's experiments and personal effects, dropped to a vacuum. In an effort to restore some of the power and systems lost following the isolation of Spektr and to attempt to locate the leak, EO-24 commander Anatoly Solovyev and flight engineer Pavel Vinogradov carried out a risky salvage operation later in the flight, entering the empty module during a so-called "intra-vehicular activity" or "IVA" spacewalk and inspecting the condition of hardware and running cables through a special hatch from Spektr's systems to the rest of the station. Following these first investigations, Foale and Solovyev conducted a 6-hour EVA outside Spektr to inspect the damage. After these incidents, the US Congress and NASA considered whether to abandon the programme out of concern for the astronauts' safety, but NASA administrator Daniel Goldin decided to continue. The next flight to Mir, STS-86, carried David Wolf aboard Atlantis. During the orbiter's stay, Titov and Parazynski conducted a spacewalk to affix a cap to the docking module for a future attempt by crew members to seal the leak in Spektr's hull. Wolf spent 119 days aboard Mir with the EO-24 crew and was replaced during STS-89 with Andy Thomas, who carried out the last US expedition on Mir. The EO-25 crew arrived in Soyuz TM-27 in January 1998 before Thomas returned to Earth on the final Shuttle–Mir mission, STS-91. Following the 8 June 1998 departure of Discovery, the EO-25 crew of Budarin and Musabayev remained on Mir, completing materials experiments and compiling a station inventory. On 2 July, Roskosmos director Yuri Koptev announced that, due to a lack of funding to keep Mir active, the station would be deorbited in June 1999. The EO-26 crew of Gennady Padalka and Sergei Avdeyev arrived on 15 August in Soyuz TM-28, alongside physicist Yuri Baturin, who departed with the EO-25 crew on 25 August in Soyuz TM-27. The crew carried out two spacewalks, one inside Spektr to reseat some power cables and another outside to set up experiments delivered by Progress M-40, which also carried a large amount of propellant to begin alterations to Mir's orbit in preparation for the station's decommissioning. 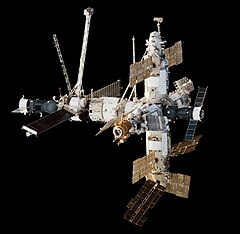 20 November 1998 saw the launch of Zarya, the first module of the ISS, but delays to the new station's service module Zvezda had led to calls for Mir to be kept in orbit past 1999. Roscosmos confirmed that it would not fund Mir past the set deorbit date. The crew of EO-27, Viktor Afanasyev and Jean-Pierre Haigneré, arrived in Soyuz TM-29 on 22 February 1999 alongside Ivan Bella, who returned to Earth with Padalka in Soyuz TM-28. The crew carried out three EVAs to retrieve experiments and deploy a prototype communications antenna on Sofora. On 1 June it was announced that the deorbit of the station would be delayed by six months to allow time to seek alternative funding to keep the station operating. The rest of the expedition was spent preparing the station for its deorbit; a special analog computer was installed and each of the modules, starting with the docking module, was mothballed in turn and sealed off. The crew loaded their results into Soyuz TM-29 and departed Mir on 28 August 1999, ending a run of continuous occupation, which had lasted for eight days short of ten years. The station's gyrodines and main computer were shut down on 7 September, leaving Progress M-42 to control Mir and refine the station's orbital decay rate. Near the end of its life, there were plans for private interests to purchase Mir, possibly for use as the first orbital television/movie studio. The privately funded Soyuz TM-30 mission by MirCorp, launched on 4 April 2000, carried two crew members, Sergei Zalyotin and Aleksandr Kaleri, to the station for two months to do repair work with the hope of proving that the station could be made safe. This was to be the last manned mission to Mir—while Russia was optimistic about Mir's future, its commitments to the ISS project left no funding to support the ageing station. Mir's deorbit was carried out in three stages. The first stage involved waiting for atmospheric drag to reduce the station's orbit to an average of 220 kilometres (140 mi). This began with the docking of Progress M1-5, a modified version of the Progress-M carrying 2.5 times more fuel in place of supplies. The second stage was the transfer of the station into a 165 × 220 km (103 × 137 mi) orbit. This was achieved with two burns of Progress M1-5's control engines at 00:32 UTC and 02:01 UTC on 23 March 2001. After a two-orbit pause, the third and final stage of the deorbit began with the burn of Progress M1-5's control engines and main engine at 05:08 UTC, lasting 22+ minutes. Atmospheric reentry (arbitrarily defined beginning at 100 km/60 mi AMSL) occurred at 05:44 UTC near Nadi, Fiji. Major destruction of the station began around 05:52 UTC and most of the unburned fragments fell into the South Pacific Ocean around 06:00 UTC. Mir was primarily supported by the Russian Soyuz and Progress spacecraft and had two ports available for docking them. Initially, the fore and aft ports of the core module could be used for dockings, but following the permanent berthing of Kvant-1 to the aft port in 1987, the rear port of the new module took on this role from the core module's aft port. Each port was equipped with the plumbing required for Progress cargo ferries to replace the station's fluids and also the guidance systems needed to guide the spacecraft for docking. Two such systems were used on Mir; the rear ports of both the core module and Kvant-1 were equipped with both the Igla and Kurs systems, whilst the core module's forward port featured only the newer Kurs. Soyuz spacecraft provided manned access to and from the station allowing for crew rotations and cargo return, and also functioned as a lifeboat for the station, allowing for a relatively quick return to Earth in the event of an emergency. Two models of Soyuz flew to Mir; Soyuz T-15 was the only Igla-equipped Soyuz-T to visit the station, whilst all other flights used the newer, Kurs-equipped Soyuz-TM. A total of 31 (30 manned, 1 unmanned) Soyuz spacecraft flew to the station over a fourteen-year period. The unmanned Progress cargo vehicles were only used to resupply the station, carrying a variety of cargoes including water, fuel, food and experimental equipment. The spacecraft were not equipped with reentry shielding and so, unlike their Soyuz counterparts, were incapable of surviving reentry. As a result, when its cargo had been unloaded, each Progress was refilled with rubbish, spent equipment and other waste which was destroyed, along with the Progress itself, on reentry. In order to facilitate cargo return, ten Progress flights carried Raduga capsules, which could return around 150 kg of experimental results to Earth automatically. Mir was visited by three separate models of Progress; the original 7K-TG variant equipped with Igla (18 flights), the Progress-M model equipped with Kurs (43 flights), and the modified Progress-M1 version (3 flights), which together flew a total of 64 resupply missions. Whilst the Progress spacecraft usually docked automatically without incident, the station was equipped with a remote manual docking system, TORU, in case problems were encountered during the automatic approaches. With TORU cosmonauts could guide the spacecraft safely in to dock (with the exception of the catastrophic docking of Progress M-34, when the long-range use of the system resulted in the spacecraft's striking the station, damaging Spektr and causing decompression). In addition to the routine Soyuz and Progress flights, it was anticipated that Mir would also be the destination for flights by the Soviet Buran space shuttle, which was intended to deliver extra modules (based on the same "37K" bus as Kvant-1) and provide a much improved cargo return service to the station. Kristall carried two Androgynous Peripheral Attach System (APAS-89) docking ports designed to be compatible with the shuttle. One port was to be used for Buran; the other for the planned Pulsar X-2 telescope, also to be delivered by Buran. The cancellation of the Buran programme meant these capabilities were not realised until the 1990s when the ports were used instead by US Space Shuttles as part of the Shuttle-Mir programme (after testing by the specially modified Soyuz TM-16 in 1993). Initially, visiting Space Shuttle orbiters docked directly to Kristall, but this required the relocation of the module to ensure sufficient distance between the shuttle and Mir's solar arrays. To eliminate the need to move the module and retract solar arrays for clearance issues, a Mir Docking Module was later added to the end of Kristall. The shuttles provided crew rotation of the American astronauts on station and carried cargo to and from the station, performing some of the largest transfers of cargo of the time. With a space shuttle docked to Mir, the temporary enlargements of living and working areas amounted to a complex that was the largest spacecraft in history at that time, with a combined mass of 250 tonnes (280 short tons). The MDSM for Crew Training was similar to NASA's 'capcom,' or capsule communicator; usually someone who had served as the Mir crew's lead trainer. Three command and control modules were constructed for the Mir program. One was used in space; one remained in a Moscow warehouse as a source of repair parts if needed, and the third eventually was sold to an educational/entertainment complex in the US. In 1997, "Tommy Bartlett's World & Exploratory" purchased the unit and had it shipped to Wisconsin Dells, Wisconsin, where it became the centrepiece of the complex's Space Exploration wing. In the later years of the programme, particularly during the Shuttle-Mir programme, Mir suffered from various systems failures. It had been designed for five years of use, but eventually flew for fifteen, and in the 1990s was showing its age, with constant computer crashes, loss of power, uncontrolled tumbles through space and leaking pipes. Jerry Linenger in his book about his time on the facility says that the cooling system had developed tiny leaks too small and numerous to be repaired, that permitted the constant release of coolant. He says that it was especially noticeable after he had made a spacewalk and become used to the bottled air in his spacesuit. When he returned to the station and again began breathing the air inside Mir, he was shocked by the intensity of the smell and worried about the possible negative health effects of breathing such contaminated air. Several accidents occurred which threatened the station's safety, such as the glancing collision between Kristall and Soyuz TM-17 during proximity operations in January 1994. The three most alarming incidents occurred during EO-23. The first was on 23 February 1997 during the handover period from EO-22 to EO-23, when a malfunction occurred in the backup Vika system, a chemical oxygen generator later known as solid-fuel oxygen generator (SFOG). The Vika malfunction led to a fire which burned for around 90 seconds (according to official sources at the TsUP; astronaut Jerry Linenger insists the fire burned for around 14 minutes), and produced large amounts of toxic smoke that filled the station for around 45 minutes. This forced the crew to don respirators, but some of the respirator masks initially worn were broken. Some of the fire extinguishers mounted on the walls of the newer modules were immovable. The other two accidents concerned testing of the station's TORU manual docking system to manually dock Progress M-33 and Progress M-34. The tests were to gauge the performance of long-distance docking and the feasibility of removal of the expensive Kurs automatic docking system from Progress spacecraft. Due to malfunctioning equipment, both tests failed, with Progress M-33 narrowly missing the station and Progress M-34 striking Spektr and puncturing the module, causing the station to depressurise and leading to Spektr being permanently sealed off. This in turn led to a power crisis aboard Mir as the module's solar arrays produced a large proportion of the station's electrical supply, causing the station to power down and begin to drift, requiring weeks of work to rectify before work could continue as normal. Without the protection of the Earth's atmosphere, cosmonauts were exposed to higher levels of radiation from a steady flux of cosmic rays and trapped protons from the South Atlantic Anomaly. The station's crews were exposed to an absorbed dose of about 5.2 cGy over the course of a 115-day expedition, producing an equivalent dose of 14.75 cSv, or 1133 µSv per day. This daily dose is approximately that received from natural background radiation on Earth in two years. The radiation environment of the station was not uniform; closer proximity to the station's hull led to an increased radiation dose, and the strength of radiation shielding varied between modules; Kvant-2's being better than the core module, for instance. The increased radiation levels pose a higher risk of crews developing cancer, and can cause damage to the chromosomes of lymphocytes. These cells are central to the immune system and so any damage to them could contribute to the lowered immunity experienced by cosmonauts. Over time, lowered immunity results in the spread of infection between crew members, especially in such confined areas. Radiation has also been linked to a higher incidence of cataracts in cosmonauts. Protective shielding and protective drugs may lower the risks to an acceptable level, but data is scarce and longer-term exposure will result in greater risks. At the low altitudes at which Mir orbited there is a variety of space debris, consisting of everything from entire spent rocket stages and defunct satellites, to explosion fragments, paint flakes, slag from solid rocket motors, coolant released by RORSAT nuclear powered satellites, small needles, and many other objects. These objects, in addition to natural micrometeoroids, posed a threat to the station as they could puncture pressurised modules and cause damage to other parts of the station, such as the solar arrays. Micrometeoroids also posed a risk to spacewalking cosmonauts, as such objects could puncture their spacesuits, causing them to depressurise. Meteor showers in particular posed a risk, and, during such storms, the crews slept in their Soyuz ferries to facilitate an emergency evacuation should Mir be damaged. The electronic musician Biosphere uses audio samples from the Mir's field recordings in the album Autour de la Lune. The South Park episode "Pinkeye" features Mir crash landing on Kenny, which instigates a zombie outbreak. Mir is featured prominently in the 1998 Michael Bay film Armageddon, where it, modified to have artificial gravity by rotating on itself, acts as a refueling hub for two American "X-71" Space Shuttle orbiters. It also appears as the main setting for the theme park ride Armageddon – Les Effets Speciaux. In the two-part Henry Danger episode "Space Invaders", a CGI Mir rendering is used for the external views of the "MRSA international space station". ^ "Mir-Orbit Data". Heavens-Above.com. 23 March 2001. Retrieved 30 June 2009. ^ "Mir FAQ – Facts and history". European Space Agency. 21 February 2001. Retrieved 19 August 2010. ^ "Mir Space Station – Mission Status Center". Spaceflight Now. 23 March 2001. Retrieved 19 August 2010. ^ "NASA – NSSDC – Spacecraft – Details – Mir". NASA. 23 July 2010. Archived from the original on 30 July 2009. Retrieved 22 August 2010. ^ "Soviet/Russian space programmes Q&A". NASASpaceflight.com. Retrieved 22 August 2010. ^ a b c d Hall, R., ed. (2000). The History of Mir 1986–2000. British Interplanetary Society. ISBN 978-0-9506597-4-9. ^ a b c Hall, R., ed. (2001). Mir: The Final Year. British Interplanetary Society. ISBN 978-0-9506597-5-6. ^ a b c "Orbital period of a planet". CalcTool. Retrieved 12 September 2010. ^ "Mir Space Station Observing". Satobs.org. 28 March 2001. Retrieved 12 September 2010. ^ Mark Wade (4 September 2010). "Baikonur LC200/39". Encyclopedia Astronautica. Archived from the original on 24 August 2010. Retrieved 25 September 2010. ^ Mark Wade (4 September 2010). "Baikonur LC81/23". Encyclopedia Astronautica. Archived from the original on 1 February 2010. Retrieved 25 September 2010. ^ Macatangay A.V. & Perry J.L. (22 January 2007). "Cabin Air Quality On Board Mir and the International Space Station—A Comparison" (PDF). Johnson Space Center & Marshall Spaceflight Center: NASA: 2. ^ a b Jackman, Frank (29 October 2010). "ISS Passing Old Russian Mir In Crewed Time". Aviation Week. ^ Patrick E. Tyler (24 March 2001). "Russians Find Pride, and Regret, in Mir's Splashdown". New York Times. Retrieved 9 March 2011. ^ a b c d e f Mark Wade. "Mir complex". Encyclopedia Astronautica. Archived from the original on 2 February 2007. Retrieved 16 April 2007. ^ Joel W. Powell & Lee Brandon-Cremer (2011) . Space Shuttle Almanac. ISBN 978-0-9696313-0-9. Retrieved 23 August 2011. ^ a b c d e f g h i j k l m n o p q r s t u v w x y z aa ab ac ad ae af ag ah ai aj ak al am an ao ap aq ar as at au av aw ax ay az ba bb bc bd be bf bg bh David Harland (30 November 2004). The Story of Space Station Mir. New York: Springer-Verlag New York Inc. ISBN 978-0-387-23011-5. ^ a b Jim Dumoulin (29 June 2001). "STS-74 Mission Summary". NASA. Retrieved 30 March 2007. ^ a b c d e f g h i David S. F. Portree (March 1995). Mir Hardware Heritage. NASA. ^ Robert Zimmerman (3 September 2003). Leaving Earth: Space Stations, Rival Superpowers and the Quest for Interplanetary Travel. Henry (Joseph) Press. p. 297. ISBN 978-0-309-08548-9. ^ a b c DeLombard R.; Ryaboukha S.; Hrovat K.; Moskowitz M. (June 1996). "Further Analysis of the Microgravity Environment on Mir Space Station during Mir-16". NASA. Archived from the original on 7 May 2009. ^ a b c d e f g h i j Bryan Burrough (7 January 1998). Dragonfly: NASA and the Crisis Aboard Mir. London, UK: Fourth Estate Ltd. ISBN 978-1-84115-087-1. ^ "European Users Guide to Low Gravity Platforms" (PDF). European Space Agency. 6 December 2005. pp. 1–3. Archived from the original (PDF) on 27 March 2009. Retrieved 13 July 2011. ^ Craig Freudenrich (20 November 2000). "How Space Stations Work". Howstuffworks. Retrieved 23 November 2008. ^ Clinton Anderson; et al. (30 January 1968). Report of the Committee on Aeronautical and Space Sciences, United States Senate—Apollo 204 Accident (PDF). Washington, DC: US Government Printing Office. p. 8. Archived from the original (PDF) on 5 December 2010. ^ Mark Wade. "Soyuz TM-3". Encyclopedia Astronautica. Archived from the original on 8 January 2010. Retrieved 11 November 2010. ^ Mark Wade. "Mir EP-2". Encyclopedia Astronautica. Archived from the original on 8 January 2010. Retrieved 8 December 2010. ^ Mark Wade. "Mir EP-3". Encyclopedia Astronautica. Archived from the original on 29 November 2010. Retrieved 8 December 2010. ^ "European Manned Spaceflight Patches" (PDF). ESA. 29 October 2009. Retrieved 15 December 2010. ^ "Biography of Chris Hadfield". Canadian Space Agency. April 13, 2013. ^ Donna Heivilin (21 June 1994). "Space Station: Impact of the Expanded Russian Role on Funding and Research" (PDF). Government Accountability Office. pp. 1–2. Retrieved 3 November 2006. ^ Kim Dismukes (4 April 2004). "Shuttle–Mir History/Background/How "Phase 1" Started". NASA. Retrieved 12 April 2007. ^ "No Mir flight for British businessman". BBC News. 27 May 1999. ^ Polly Sprenger (26 May 1999). "UK Businessman Booted Off Mir". Wired. Retrieved 16 July 2015. ^ Fred Guterl (1 January 1998). "One Thing After Another". Discover. Retrieved 5 February 2011. ^ a b "From Mir to Mars". Public Broadcasting Service. Retrieved 14 September 2008. ^ "Astronaut Hams". Archived from the original on 30 December 2006. ^ a b c d e Jerry Linenger (1 January 2001). Off the Planet: Surviving Five Perilous Months Aboard the Space Station Mir. New York, US: McGraw-Hill. ISBN 978-0-07-137230-5. ^ a b Jay Buckey (23 February 2006). Space Physiology. Oxford University Press USA. ISBN 978-0-19-513725-5. ^ Amiko Kauderer (19 August 2009). "Do Tread on Me". NASA. Retrieved 23 August 2009. ^ "Preventing "Sick" Spaceships - Science Mission Directorate". science.nasa.gov. ^ "Mutant space microbes attack ISS: 'Munch' metal, may crack glass". RT. 23 April 2012. Retrieved 9 May 2015. ^ Trudy E. Bell (2007). "Preventing "Sick" Spaceships". ^ a b "Mutant fungus from space". BBC. 8 March 2001. Retrieved 9 May 2015. ^ a b c d e f g h i j k l m Rex Hall & David Shayler (2003). Soyuz: A Universal Spacecraft. Springer-Praxis. ISBN 978-1-85233-657-8. ^ Alexander Anikeev. "Spacecraft "Soyuz-T15"". Manned Astronautics. Archived from the original on 1 March 2009. Retrieved 16 April 2007. ^ Mark Wade. "Mir EO-1". Encyclopedia Astronautica. Archived from the original on 7 April 2007. Retrieved 18 April 2007. ^ Mark Wade. "Mir EO-2". Encyclopedia Astronautica. Archived from the original on 9 April 2007. Retrieved 18 April 2007. ^ Anatoly Zak. "Spacecraft: Manned: Mir: Kvant-1 Module". RussianSpaceweb.com. Archived from the original on 24 April 2007. Retrieved 16 April 2007. ^ a b Mark Wade. "Mir EO-5". Encyclopedia Astronautica. Archived from the original on 9 April 2007. Retrieved 18 April 2007. ^ Anatoly Zak. "Spacecraft: Manned: Mir: Kvant-2 Module". RussianSpaceWeb.com. Archived from the original on 24 April 2007. Retrieved 18 April 2007. ^ a b Mark Wade. "Mir EO-6". Encyclopedia Astronautica. Archived from the original on 11 April 2007. Retrieved 19 April 2007. ^ a b Anatoly Zak (25 May 2010). "Spacecraft: Manned: Mir: Kristall Module". RussianSpaceWeb.com. Archived from the original on 14 May 2011. Retrieved 17 December 2010. ^ Mark Wade. "Mir EO-10". Encyclopedia Astronautica. Archived from the original on 7 April 2007. Retrieved 19 April 2007. ^ Mark Wade. "Spektr". Encyclopedia Astronautica. Archived from the original on 7 April 2007. Retrieved 21 April 2007. ^ Mark Wade. "Priroda". Encyclopedia Astronautica. Archived from the original on 10 April 2007. Retrieved 21 April 2007. ^ "STS-60 Mission Summary". NASA. 29 June 2001. Retrieved 10 January 2014. ^ a b c d e f g h i j k "Shuttle–Mir History/Shuttle Flights and Mir Increments". NASA. Retrieved 30 March 2007. ^ Jim Dumoulin (29 June 2001). "STS-63 Mission Summary". NASA. Retrieved 30 March 2007. ^ Kathy Sawyer (29 January 1995). "US & Russia Find Common Ground in Space – Nations Overcome Hurdles in Ambitious Partnership". Washington Post. NewsBank. p. a1. ^ David Scott & Alexei Leonov (30 April 2005). Two Sides of the Moon. Pocket Books. ISBN 978-0-7434-5067-6. ^ Jim Dumoulin (29 June 2001). "STS-71 Mission Summary". NASA. Retrieved 30 March 2007. ^ Nick Nuttall (29 June 1995). "Shuttle homes in for Mir docking". The Times. NewsBank. ^ "CSA – STS-74 – Daily Reports". Canadian Space Agency. 30 October 1999. Archived from the original on 16 July 2011. Retrieved 17 September 2009. ^ William Harwood (15 November 1995). "Space Shuttle docks with Mir – Atlantis uses manoeuvres similar to those needed for construction". Washington Post. NewsBank. p. a3. ^ William Harwood (28 March 1996). "Shuttle becomes hard-hat area; spacewalking astronauts practice tasks necessary to build station". Washington Post. NewsBank. p. a3. ^ Jim Dumoulin (29 June 2001). "STS-76 Mission Summary". NASA. Retrieved 30 March 2007. ^ Jim Dumoulin (29 June 2001). "STS-79 Mission Summary". NASA. Retrieved 30 March 2007. ^ Jim Dumoulin (29 June 2001). "STS-81 Mission Summary". NASA. Retrieved 30 March 2007. ^ David Hoffman (22 August 1997). "Crucial Mir spacewalk carries high hopes – continued Western support could hinge on mission's success". Washington Post. pp. a1. ^ Jim Dumoulin (29 June 2001). "STS-86 Mission Summary". NASA. Retrieved 30 March 2007. ^ Jim Dumoulin (29 June 2001). "STS-89 Mission Summary". NASA. Retrieved 30 March 2007. ^ Jim Dumoulin (29 June 2001). "STS-91 Mission Summary". NASA. Retrieved 30 March 2007. ^ William Harwood (13 June 1998). "Final American returns from Mir". Washington Post. NewsBank. p. a12. ^ "Mir Destroyed in Fiery Descent". CNN. 22 March 2001. Archived from the original on 21 November 2009. Retrieved 10 November 2009. ^ "The Final Days of Mir". The Aerospace Corporation. Archived from the original on 3 August 2009. Retrieved 16 April 2007. ^ "Mir Space Station Reentry Page". Space Online. Archived from the original on 14 June 2007. Retrieved 16 April 2007. ^ Kim Dismukes (4 March 2004). "Shuttle–Mir History/Spacecraft/Mir Space Station/Soyuz". NASA. Retrieved 11 February 2010. ^ Kim Dismukes (4 March 2004). "Shuttle–Mir History/Spacecraft/Mir Space Station/Progress Detailed Description". NASA. Retrieved 11 February 2010. ^ Mark Wade. "Mir Docking Module". Encyclopedia Astronautica. Archived from the original on 8 January 2010. Retrieved 11 February 2010. ^ a b Yuri Karash (14 August 2000). "Russia's Mission Control: Keeping ISS Aloft". Space.com. Archived from the original on 7 February 2010. Retrieved 13 July 2011. ^ a b "Shuttle-Mir Background – Mission Control Center – Moscow". NASA. 4 April 2004. Retrieved 6 November 2010. ^ Air & Space/Smithsonian, October/November 1997, p. 17 'Mir Lands in Wisconsin"
^ Yang TC; et al. (1997). "Biodosimetry Results from Space Flight Mir-18". Radiation Research. 148 (148): S17–S23. Bibcode:1997RadR..148S..17Y. doi:10.2307/3579712. JSTOR 3579712. ^ Badhwar GD; et al. (1998). "Radiation environment on the Mir orbital station during solar minimum". Advances in Space Research. 22 (4): 501–510. Bibcode:1998AdSpR..22..501B. doi:10.1016/S0273-1177(98)01070-9. PMID 11542778. ^ "Report of the United Nations Scientific Committee on the Effects of Atomic Radiation to the General Assembly" (PDF). 26 July 2000. Retrieved 6 February 2011. ^ Berger T; et al. (2001). "Measurement of the Depth Distribution of Average LET and Absorbed Dose Inside a Water – Filled Phantom on Board Space Station MIR" (PDF). Physica Medica. 17 (Supplement 1): 128–130. PMID 11770528. Retrieved 6 February 2011. ^ "Space Debris Basics | The Aerospace Corporation". www.aerospace.org. Archived from the original on 8 December 2015. Retrieved 28 November 2015. ^ Klinkrad, Heiner (2006). 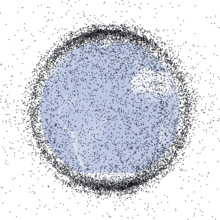 Space Debris: Models and Risk Analysis. Praxis Publishing Ltd. p. 83. Bibcode:2006sdmr.book.....K. ISBN 978-3540376743. ^ F. L. Whipple (1949). "The Theory of Micrometeoroids". Popular Astronomy. 57: 517. Bibcode:1949PA.....57..517W. ^ Henry Nahra (24–29 April 1989). "Effect of Micrometeoroid and Space Debris Impacts on the Space Station Freedom Solar Array Surfaces" (PDF). NASA. Retrieved 7 October 2009. ^ Leonard David (7 January 2002). "Space Junk and ISS: A Threatening Problem". Space.com. Archived from the original on 23 May 2009. Retrieved 13 July 2011. Wikimedia Commons has media related to Mir.